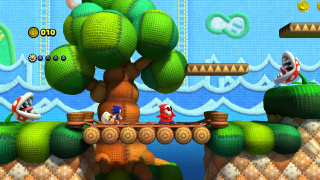 Yoshi's Island Zone is a DLC level in Sonic Lost World that is exclusive to the Wii U version of the game. It was released as a free download on the Nintendo eShop on December 18, 2013. Yoshi's Island Zone draws many inspirations from the Yoshi series of games, with the stage itself being set in an environment from Yoshi's Story, and the music being a remix of the Flower Garden theme from Super Mario World 2: Yoshi's Island. Set entirely on a 2.5D perspective, the main objective is for Sonic to rescue as many Yoshi Eggs as possible and bring them to the Goal Ring at the end. To find Yoshi Eggs, Sonic must hit Egg Blocks from underneath to release the eggs and must take care not to get hit, as that will make him lose any eggs that are following him. In addition, rings have been replaced with coins that function the same way as rings, and Red Rings are replaced with Smiley Flowers that are added to the Goal Ring roulette at the end. The enemies in this level are not Badniks, but enemies that typically appear in Yoshi games. Shy Guys are easily dispatched by all means, but Piranha Plants cannot be attacked directly, and require Sonic to kick Shy Guys into them to defeat them. Other features the player will find are Warp Pipes that take the player to bonus rooms, and Spring Balls that catapult the player into the air. Once Sonic passes the Goal Ring, the Zone ends, and any Yoshi Eggs that the player has collected will hatch into Yoshis, with each Yoshi giving the player 3 extra lives. If the roulette on the Goal Ring stops on a Flower, the player will be awarded with 10 more lives. Like all DLC levels, once Yoshi's Island Zone is completed, it will disappear from the World Map. It will reappear after the player scores another 100,000 points. Yoshi's Story previously appeared as a Dream Event in Mario & Sonic at the London 2012 Olympic Games. This page was last edited on 8 April 2018, at 07:48.